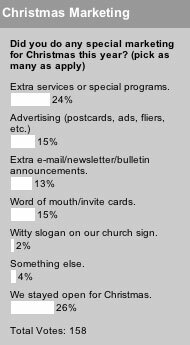 Last week we asked what kind of Christmas marketing your church used. Simply staying open or offering extra services or special programs were the most common responses. More traditional advertising like postcards, fliers, e-mail, bulletins and word of mouth came in next. While our list of marketing examples was hardly exhaustive, very few people noted that their church tried something else. Which means we either did a good job writing the poll or churches weren’t very creative this year–we’ll let you decide. This week we ask about your church marketing New Year’s resolution. Mine is to answer all the CMS e-mail and to not let another week go by without a post.